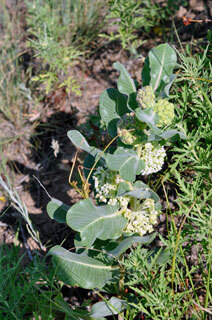 Asclepias latifolia (Torr. ) Raf. Stems: Erect, usually simple; plants glabrescent or slightly tomentose, glaucous with age; sap milky. Leaves: Opposite; petiole less than 1/5 inch; blade broadly obovate to oblong or nearly round, 3 to 5 inches long, 2.5 to 4 inches wide, margins undulate, tip rounded or notched. Inflorescences: Cymes, 2-10, terminal and axillary, umbel-like, 30-55-flowered. Flowers: 2/5 to 3/5 inch; calyx lobes ovate-lanceolate, 1/8 to 1/6 inch; corolla pale green, lobes 5, reflexed, elliptic-lanceolate, 1/4 to 2/5 inch; hoods 5, white or greenish white, ascending or strongly ascending, 1/8 to 1/6 inch, margins entire, apex truncate to retuse; horns broadly sickle-shaped, attached to hoods their full lengths, arching over anther head. Fruits: Pods, broadly spindle-shaped, 2.4 to 3.1 inch long, .6 to 1.2 inch wide, smooth, nearly glabrous; seeds elliptic, 1/4 to 1/3 inch; tufted with tan hairs .8 to 1.2 inch long. Habitat: Gravelly to sandy mixed-grass and shortgrass prairies. Comments: Asclepias (for Aesculapius, Greek god of medicine) and latifolia (broad + leaf).